If you don’t already receive the Passanante’s Home Food Service email newsletter you’re missing out on our fabulously simple and delicious featured recipes! Make sure you keep up with us on Facebook, Twitter and our newsletter for more great ideas for the kitchen and exclusive product annoucements. 1. In small saucepan, mix all ingredients and set over medium heat. 2. Cook for 15-20 minutes, or until apples and onions are softened. 3. Keep warm in a separate dish. 2. Rub each chop with a small amount of oil, then season generously with salt and pepper. 4. Remove from grill and set on plate for 5 minutes to rest. 5. 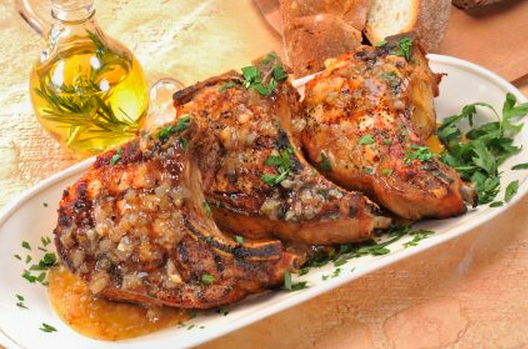 Serve chops with a dollop of apple compote on top and a side of apple. These mouth-watering meat treats feature tender filet mignon threaded onto a bamboo skewer and topped with a gently marinated mushroom cap. 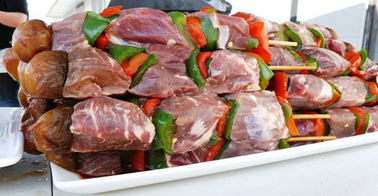 This entry was posted in Pork, Recipes and tagged Apple Compote, Bristol PA, FIlet Mignon Skewers, Food Delivery Service, Free Food Sample, Grilled Pork Chops, Hormone-Free Meat, Passanante's Home Food Service, Recipe by Passanante's Home Food Service. Bookmark the permalink.